A long time ago, Momzerduck said to me "Hermann Tilke's house probably has one very long hallway, then lots of small twisty hallways coming off of it." 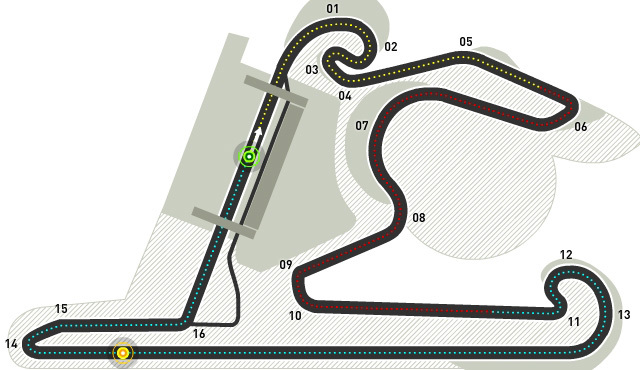 Here's the track map for Shanghai International Circuit. The Varsha should be back at the helm of the Legendary Announce Team during SPEED's coverage of the Grand Prix of China, which begins with Friday's Second Practice from 1am to 240am. Quals will come to us almost live on Saturday from 1am to 230am. The actual race, however, is from 130am to 4am Sunday morning, with a replay from 1pm to 330pm later that afternoon. 1 Yay! I was watching the Indy race from Barber Motorsports Track last week, now that's a circuit. Windy and fun, and a little lacking in runoffs (thankfully not an issue). And sculptures! F1 needs more random sculptures. 2 Other than the sculpture of St Fangio the Quick at Monaco, I can't think of any other, so I have to agree. If Bernie is interested in a US track, the Barber track would be an ideal choice. It wouldn't have his preferred view of NYC, but a beautiful track nonetheless. 21kb generated in CPU 0.04, elapsed 0.1827 seconds. 47 queries taking 0.1573 seconds, 246 records returned.